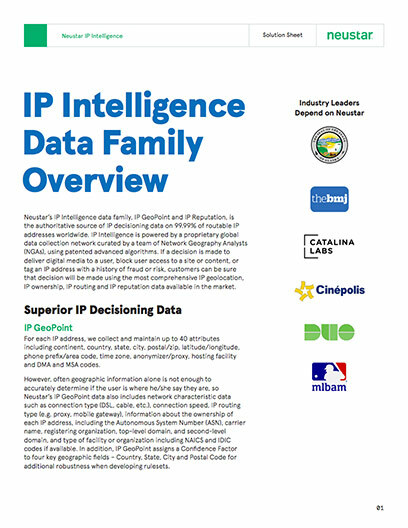 Neustar’s IP Intelligence data family, IP GeoPoint and IP Reputation, is the authoritative source of IP decisioning data on 99.99% of routable IP addresses worldwide. IP Intelligence is powered by a proprietary global data collection network curated by a team of Network Geography Analysts (NGAs), using patented advanced algorithms. If a decision is made to deliver digital media to a user, block user access to a site or content, or tag an IP address with a history of fraud or risk, customers can be sure that decision will be made using the most comprehensive IP geolocation, IP ownership, IP routing and IP reputation data available in the market. For each IP address, we collect and maintain up to 40 attributes including continent, country, state, city, postal/zip, latitude/longitude, phone prefix/area code, time zone, anonymizer/proxy, hosting facility and DMA and MSA codes. However, often geographic information alone is not enough to accurately determine if the user is where he/she say they are, so Neustar IP GeoPoint data also includes network characteristic data such as connection type (DSL, cable, etc. ), connection speed, IP routing type (e.g. proxy, mobile gateway), information about the ownership of each IP address, including the Autonomous System Number (ASN), carrier name, registering organization, top-level domain, and second-level domain, and type of facility or organization including NAICS and IDIC codes if available. In addition, IP GeoPoint assigns a Confidence Factor to four key geographic fields – Country, State, City and Postal Code for additional robustness when developing rule sets. In an era when fraudsters can obfuscate their actual location and use stolen credentials to make online purchases, or malicious actors can unleash “botnets” and “Zombies” to perform distributed denial-of-service attacks (DDoS attack), steal data or send spam, IP Reputation is the first line of insight for businesses to differentiate real-user traffic from “non-human” traffic. Risk Score – Score between 1 and 100 The higher the number, the more likely the IP address has been associated with risky activity. IP Reputation provides a clear view of the relative risk associated with an IP address and whether it’s coming from a known or anonymous source. This is power you need to effectively identify and block risky actors from accessing your online site or infrastructure. And if you are using Neustar’s IP GeoPoint data to target delivery of streaming media, IP Reputation helps you mitigate risk by ensuring you are delivering your premium content to your paying subscribers, and blocking access by unauthorized viewers who may be attempting to pirate your content. Use IP GeoPoint geolocation data to accurately identify a user’s physical location. “Geo-authentication” enables you to restrict access to premium content including channel line-ups, live streaming events and video on demand. Access can be restricted by DMA or MSA, or by city, state or country. Identify your good customers in real time, while putting the brakes on access from risky or unknown IP addresses. Accurately determine where an IP address is located and if it is connecting from an anonymous proxy. Using IP GeoPoint, you can create robust fraud prevention programs, while providing your trusted customers with the great online experience they have come to expect. Neustar’s IP Intelligence data, with its superior IP geolocation, proxy and risk data, provides your threat intelligence and cybersecurity teams with the data necessary to assess the trustworthiness of network connections and identify any potential threats to your infrastructure. Step in the journey thus reducing the need for high friction knowledge based authentication (KBA) and identity verification processes. IP GeoPoint data provides you the IP decisioning data you need to accurately determine where a user is located before they access your website, or download content or software. This geo-compliance power is critical for organizations that are bound by regulatory mandates that prohibit access from users in high risk regions or countries. For online gaming and gambling operators, knowing the actual location of your players can mean the difference between success and failure. You must be able to accurately determine where a player is really located to make sure they are not coming in from a country that is restricted per your operator’s license, or via an IP address that presents unacceptable risk to your organization. We collect IP data from numerous countries across 5 continents. The amount and variety of sources and “freshness” means that final IP assignments are based on “evidence” and not just scraped from registries. Plus, updates are made around the clock to ensure the IP decisioning data you use is as current and accurate as possible. We use patented proprietary technologies and algorithms to ensure complete and accurate data collection, tracking and mapping on every routable IP address across the globe. And by augmenting our IP geolocation data with insights derived from our partners and customers, we produce superior, granular city level data down to zip+5 postal codes. Neustar’s IP Intelligence delivers accurate insight for up to 40 attributes including data on what DMA, city, state or country an IP is coming from, how that IP is connected to the Internet, if it is coming via an anonymous proxy, its IP attributes, and the risk and reputation of that IP address. Automation alone cannot map the Internet - deep understanding by experts who speak the language of IP Intelligence is necessary. We complement our advanced technology with a team of experts in the field who know how to recognize abbreviations and decode patterns so provide you with the highest quality decisioning data available.